Here’s the thing about biological systems: stuff happens. Such was the case for Steve Orloff in the spring of 2014. 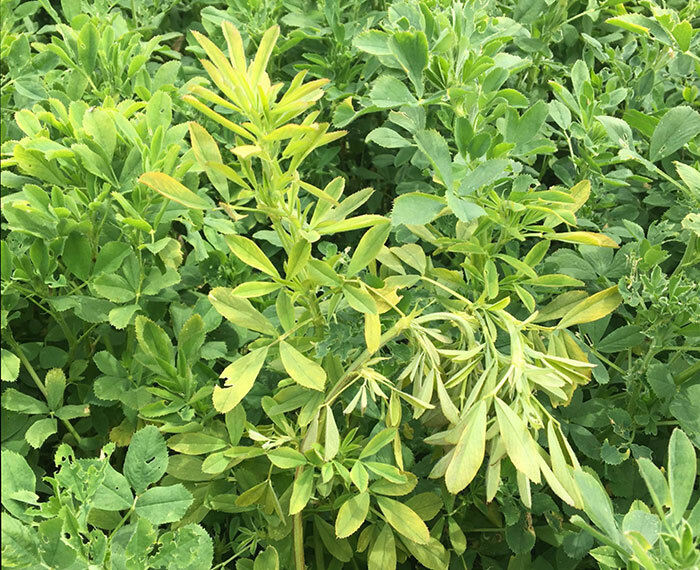 The extension farm advisor in Siskiyou County, Calif., was on a farm to troubleshoot alfalfa crop injury where glyphosate had been previously applied. The perplexing part of the situation was that this was Roundup Ready alfalfa. In a small area that hadn’t been sprayed, alfalfa was 8–12 inches taller than where glyphosate had been applied. It also didn’t exhibit the yellowing and necrosis found in the sprayed area. The same thing occurred in several other fields that spring. Orloff eliminated typical causes such as spray tank contamination, contaminated product, and other nonherbicide-related management practices. In search of answers, Orloff established field plots in the unaffected area, comparing several glyphosate treatments to see if he could duplicate the damage. No detrimental effect was noted from any of the treatments. He concluded the damage exhibited that spring was just an unexplained, single-year aberration, but that theory blew up when similar alfalfa damage occurred during the following spring (2015) in a different grower’s field. “We developed the theory that cold temperatures after an application of glyphosate might be related to the observed injury,” said Orloff at the Western Alfalfa & Forage Symposium in Reno, Nev.
Orloff measured the first-cut yield differences to be about 0.75 ton per acre in two different fields that had suffered the glyphosate damage. Next, Orloff put out field plots in Tulelake, a cooler region, where he was hoping to duplicate the injury. He compared two rates of glyphosate (22 and 44 ounces per acre of Roundup PowerMAX) with and without ammonium sulfate (AMS). He found that compared to the untreated control, the 22 ounce rate of glyphosate reduced yield by 0.3 tons and 0.4 tons per acre for the 44 ounce rate. The addition of AMS made no difference. During the fall of 2015, Orloff then established field trials at four locations, knowing that colder temperatures would eventually come. Weekly applications (mid-September to November 1) of two rates of glyphosate were made and compared against the untreated control. This time the plant damage symptoms were replicated and there was a significant rate response. In spring 2016 and with the help of extension colleagues, Orloff established 16 trials at various locations. He evaluated both glyphosate rate and application timing. Though early April was characterized by warmer temperatures and more rainfall than 2015, cooler temperatures prevailed at some locations later in the month. Some trials were lost for reasons beyond the researchers’ control, but reliable data was obtained from most of the trials. Also, injury symptoms were observed in all but one of the 16 trials. The trial with no injury was a new seeding field from the previous fall. Orloff said that the injury has been found to be more dramatic on older, more established stands. Additionally, this was the warmest of all the sites. Injury was not as severe as what was seen in the previous two years. Injury was variable with more damage being seen at colder sites and where applications were made to taller (8 to 10 inches) versus shorter (4 to 5 inches) alfalfa. Where short alfalfa was sprayed (2 inches), no treatment effects were observed. Higher application rates (44 ounces per acre) resulted in more stunting than lower application rates (22 ounces per acre). First-cut yield decline was typically 0.3 to 0.4 ton per acre for the 44 ounces per-acre rate compared to 0.1 to 0.3 ton per acre for the 22 ounces per-acre rate. No yield differences were seen at any location for the second cutting. Orloff pointed out that an herbicide application treatment using Sencor and Gramoxone also suffered yield reductions compared to the untreated control. This was true at all of the sites. Specific to glyphosate, the injury is characterized as plants having wilted shoots initially appearing 10 days to two weeks after application. At two to three weeks, Orloff said plants start to become chlorotic and eventually necrotic and there is shepherd’s crooking of stems. Orloff said the exact reason for the plant injury is not known. He said it could be that the postapplication cold weather is affecting the tolerance of Roundup Ready alfalfa to glyphosate, but he doesn’t think that’s the case. Alternatively, it might be that the glyphosate is affecting the cold tolerance of alfalfa directly or indirectly, or perhaps it could be something else entirely. In summary, Orloff recommends that glyphosate be applied in the spring when alfalfa growth is 2 inches tall or less, assuming there is a risk of cold weather following the application. This is similar to other postemergence herbicides with spring-growth restrictions. Early applications also help to ensure effective control because weeds are smaller. Applied early, glyphosate can also be tank mixed with other soil residual herbicides. Orloff warned that if glyphosate is used alone and the application is made too early, subsequent weed emergence might occur. Orloff doesn’t feel the higher 44 ounces per-acre rate is needed for spring applications. As for how long the interval has to be between the glyphosate application and a frost event such that crop damage is avoided, Orloff just doesn’t have the answer to that question at this time. “If we knew that answer, then it would be conceivable to plan later applications based on future weather forecasts,” Orloff said. However, spring frosts are so unpredictable that this is probably not the preferred approach and if applications are delayed the alfalfa (and the weeds) would be taller. “We also don’t know how the degree or duration of cold temperatures comes into play,” he added.